The number of Pacific Golden Plover seen at Pūkorokoro-Miranda this summer may be the most ever recorded here, a development which will hopefully help inspire more research on where they come from, writes Jim Eagles. As we wandered from the Findlay Reserve car park to the hides we made the usual stop, beside the information panel telling the tragic story of the Pūkorokoro village, and glanced across the mudflats that sweep south. Often at this time of year there are a few Pacific Golden Plover feeding out there and sometimes a Whimbrel doing a mysterious dance in the grasses on the other side. On this occasion the Whimbrel was absent but there were plenty of plovers to be seen. These are arguably the prettiest of the Arctic waders that fly south to enjoy our summer, especially when they are in their black, white and golden breeding plumage. We set up our scopes and started counting. There were 38 of the birds feeding on the mud, within the range of the numbers usually recorded at Pūkorokoro Miranda in recent years, which vary from 20s to 50s. But then my scope drifted across the small grassy peninsula sticking out into the mudflats and suddenly there were a lot more of those elegant, rounded, golden heads to be seen, dozens of them, popping up above the Sarcocornia and grass, then dropping down again, making it very difficult to count. Eventually we agreed on 41 making an overall tally of 79. Very impressive. In an age of declining bird numbers that was all encouraging news. And, in fact, the International Union for the Conservation of Nature does classify the Pacific Golden Plover as being of Least Concern, mainly because the worldwide population is so large: c190,000-250,000. It’s possible the population is declining but the IUCN says trends are unclear so the overall pattern is unknown. Although it’s the fourth most common of the Arctic migrants to visit New Zealand, the number of plovers coming here is pretty small. Since 2005 the national count has ranged from 64-301 a year, with very few overwintering. They are usually found in flocks of 10-50 in harbours, estuaries and the odd lake, so to have 129 at Pukorokoro is quite something. Not only are they beautiful birds, a joy to watch, they possess the added attraction of being surrounded in mystery because we still don’t know where they come from. Pacific Golden Plovers breed in a big chunk of Siberia and Alaska on either side of the Bering Sea. In June they lay four eggs in shallow lichen-lined nests scraped in the tundra, and when the chicks emerge about a month later they are generally cared for by both parents. Then around August-September, and sometimes October in the case of juveniles, they head south to a vast spread of wintering grounds from southern Japan and the Hawaiian Islands in the east, through Australia, New Zealand and the islands of the South Pacific, to India and northeast Africa in the west. They arrive here September-November and depart March-early April. NZ Birds Online calls them ‘this beautiful gold-spangled plover’ and, as you can see from the photos, when they’re in breeding plumage the crown, nape, back, upper wings and upper tail are densely spangled with gold, black and white, set off dramatically by a white stripe from the eyebrow down the neck and along the side, a dense black front and dark orange legs. Post-breeding the plumage gradually turns to an attractive apricot-buff colour but often still with areas of the black and gold speckling present. Even the call is quite beguiling, a series of slow, slurred whistles, which echo across the mudflats, while the flight call is a clear, melodious shu-eeet. These plovers rely on their big eyes to spot signs of food, moving in short, sharp bursts to seize unwary small crabs, marine worms, insects, larvae, spiders, earthworms and molluscs, which they apparently supplement with energy-packed berries during the breeding season on the Arctic tundra. But the actual routes they followed were largely unknown until quite recently when a major research programme was launched making use of modern technology. In 2009, a team led by Wally Johnson of Montana University, the leading authority on Pacific Golden Plovers, fitted geolocators to birds caught in Hawaii, where many thousands winter, and recorded them flying fairly directly to their breeding grounds in Alaska and back again (see top map at right). The following year Johnson’s team put geolocators on birds in American Samoa, Saipan and Nome in western Alaska. They were able to track those from Nome and Samoa making an annual, triangular, clockwise journey around the Pacific (see middle map). As Alaska cooled, the plovers headed south via the Mid-Pacific Flyway, with the Nome birds going to Christmas Island, Marshall Islands, Gilbert Islands, Fiji and Fraser Island off the Queensland Coast, while the Samoan birds returned to Samoa. In spring they flew northwest from their various islands to Japan (the Fraser Island bird going via Taiwan) where they made stopovers averaging three weeks. Then they went northeast to spend the northern summer back in Alaska. The Saipan birds mostly followed the East Asian-Australasian Flyway, with stopovers in Japan and elsewhere in Asia, before continuing on to nest sites in Chukotka and Kamchatka in Siberia. In the northern autumn, they flew back the same way. Over the next couple of years Johnson’s team, working with our Russian friend Pavel Tomkovich, put geolocators on plovers caught in Chukotka to see where Siberian birds fitted into the mix. When autumn arrived the four birds tracked first made short pre-migratory flights, to places like Kamchatka and Alaska’s Pribilof Islands, either side of the Bering Sea. Then they headed south, stopping over in Japan, Taiwan and northern China, and spending their northern winters variously in China, Philippines and South Korea. Come the northern spring they flew back to their nesting grounds in Siberia by roughly the same routes (see bottom map which only shows the northward flights). One significant discovery from the geolocator tracking is that, unlike most other Arctic migrants, these plovers seem to avoid the fast-developing Yellow Sea, which is probably a key factor in their fairly healthy population. 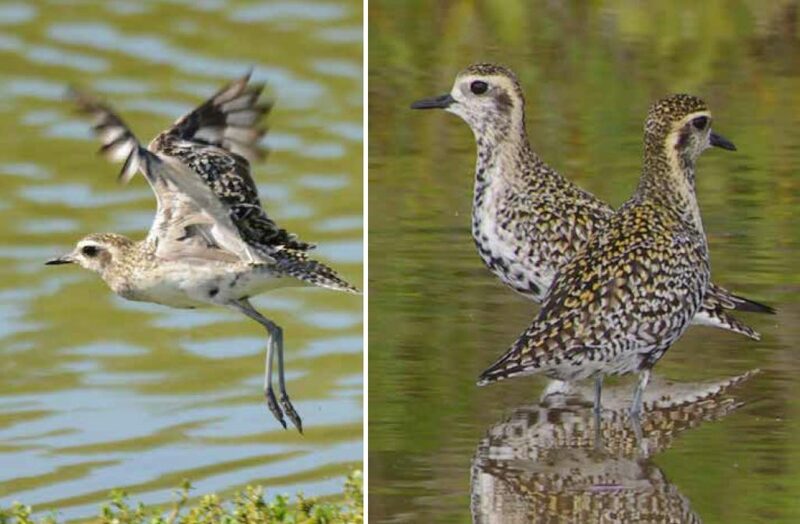 GOLDEN GIRLS: (from left) Pacific Golden Plover in flight in Hawaii; a beautiful portrait of plovers by Dorothy Pashniak who grew up on the Hauraki Plains and went to Te Aroha High but now lives in Cooloola Cove, Queensland, where she takes bird photos from a kayak. Photos / Jim Denny; Dorothy Pashniak. However, while all this research has been very revealing about the amazing long-distance flights of these birds, since none of the plovers tracked came to New Zealand, and there aren’t any records of plovers with bands being seen here either, there still isn’t any evidence of where our birds come from. The best hint we’ve got so far is that the available records suggest the plovers that visit our nearest neighbours, including Fiji, American Samoa and, most notably, southeastern Australia, come from Alaska. These include the Alaskan bird with a geolocator going to Fraser Island, a bird tagged in the Pribilof Islands being recovered in New South Wales, five birds banded in Nome sighted in Queensland, plus a morphometric study of Pacific Golden Plover in Victoria concluding that the birds there breed in Alaska. Indeed, apart from a bird banded in Siberia being seen in Darwin (more than 5000km from New Zealand) for two successive seasons, the records from across the Tasman, all point to Alaska. In his Shorebirds of New Zealand, Keith Woodley outlines an intriguing theory which might confirm that Australian and New Zealand birds are part of the same population. Keith notes that in the Pacific islands golden plovers seem well-adapted to sharing the landscape with humans, having been reported feeding happily in pastures, tilled land, burned fields, golf courses, playing fields, cemeteries, residential lawns, roadsides and airfields, as well as mudflats, estuaries, shorelines and beaches. That said, Wally also thinks it’s an interesting question. Maybe, he hopes, this article might prompt New Zealand birders to look more closely at Pacific Golden Plovers for bands. ‘Could be one of our birds from Nome might show up. Our birds are variously colour-banded: one or two colours plus a metal band. Almost any PAGP wearing bands will be mine. ‘Maybe we should think about doing some tagging there and track your birds. The new GPS pinpoints would be ideal since they don’t need to be recovered like geolocators. There is, of course, much interest, and we’re hoping to see Wally here next year.